The recent Space Career Fair, held in conjunction with the 24th National Space Symposium in Colorado Springs, is a good barometer with which to gauge the workforce of today � and the future. SatMagazine was delighted to learn Adam Keith, a Analyst at Euroconsult, was available to discuss his analysis and thoughts on the transformation of the Earth Observation (EO) sector of our industry... which was quite timely, given the theme of our May issue! In the satellite industry, the word �hybrid� is used in reference to a variety of types of services. Often the context is some combination of satellite and terrestrial technology that is used to provide a service to an end-client. A typical example would be to use satellite to connect a remote location to a teleport, and then use fiber to backhaul the traffic from the remote site to another location, or for access to the greater Internet backbone. In March of 2008, Hughes Network Systems (HNS) announced having shipped 400,000 satellite VSAT terminals with DVB-S2 and Adaptive Code Modulation (ACM) capabilities. Russia�s information technology and communications� business is already valued at 42 billion euros, an increase of 25.4 percent over 2006, and likely to top 50 billion euros in value by the end of this year. At every level, there�s impressive growth. Some examples drawn from Russia�s 49 million households (149 million people): computer ownership rising by 35 percent annually; Internet users up 40 percent annually; and, most importantly for us, the number of cable TV subs up 35 percent last year, and taking penetration beyond the main cities to 27.6 percent of the population. The 50-year anniversary of the launch of Sputnik, humanity�s first venture into space, served to refocus global attention on the enormous progress made since the dawn of the Space Age. While space-related government programs and business activities have been more evolutionary than revolutionary on the whole throughout this era, human space activity has also been defined by sudden surges or changes driven by emergent forces. The world our grandparents, fathers, and mothers experienced was far larger than the world we occupy today. Faster vehicles have sliced distance to the point where a trip overseas requires little in the way of second thought � (except as to exactly what we must pack). Communication with other countries is a snap�areas of the globe once the domain of intrepid explorers and the ink-smudged fingers of cartographers are now mapped quickly, and in high resolution � by satellites. There are few greater rewards in life than working hard, attaining a measure of success, and then using those benefits to help others. One such individual is J. Armand Musey.... He may be used to the ups and downs of the stock market, but Wall Street�s J. Armand Musey will soon be walking on new terrain�climbing Mt. Everest in an adventure that completes a personal goal as well as raises critically needed funds for the American Red Cross� International Response Fund (IRF). He was the lead industry analyst at Bank of America and later Solomon Smith Barney. In 2003, he partnered with a colleague to form the boutique investment banking firm Near Earth, LLC. Musey left the presidency of Near Earth in 2007 to train full-time for his attempt to scale Mt. Everest, the world's highest peak. Increased demand, advanced technologies, and limited resources will all play roles in remote sensing�s potentially sunny, but challenging, future. The Telstar experiment grew out of the Bell Systems' interest in overseas communication. SNG became popular with broadcasters as a replacement for microwave technologies because of its extended geographic reach and potential for supporting broader and deeper reporting of key local events. It also enabled timely coverage of global issues, with the technology�s pioneering use often bringing television viewers fresh images from war-torn areas of the world. With the industry wide shift to digital technologies, DSNG increasingly became a mainstream means of delivering SD content. 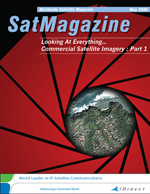 An in-depth look at the world of satellite imagery is offered this month.